Hi! I’m Lise and welcome to Elle Be! You can navigate throughout the entire site from this menu. Read my about page to find out more about myself and Elle Be, sign up for my monthly newsletters, check out my shop or just head back to the home page where you’ll find all the blog posts! Oh, and don’t forget to follow me on social media! Elle Be a high vibe lifestyle. I wear many hats! When it comes to Robi Luxury Skin Care, I started the business by doing everything from scratch- including product formulation and labels. Luckily, soon after launching, I was able to outsource a few things including those two. So now I focus my energy on marketing, social media, daily operations, and dreaming up new products. On top of that, in the last year, I opened a brick + mortar shop with some of my green beauty friends, Lines of Elan. It’s called eco+amour and it’s a beauty and home product refill shop. It’s such a cool, environmentally-friendly concept and I’m so happy to be a part of it. For e+a, I take care of vendor relations, social media, the blog, PR, and overall strategy. When do you wake up? What do your mornings usually look like? I wake up around 6/6:30 a.m. and the first hour is dedicated to getting my oldest ready for school. I make myself a lemon juice + pink Himalayan salt water followed by coffee. I usually listen to the radio on my phone so I can catch up on news, current events and weather. Other than that, I don’t check emails or social media for at least 30-45 minutes from wake up. Many wellness experts encourage starting your mornings sans phone and I am totally on board! If I was able to wake up before my kids, I would take advantage of that free time to meditate and set an intention for the day. Maybe one day! I have already caught up on personal and work emails (I have four email tabs open at all times on my computer, agh!) and try to tick off as many to-dos as possible. Then, around this time - on some days - I head over to the gym for some weightlifting (tip: I lay out my gym clothes the night before so I have no excuse to get gym ready). There’s a daycare there so I bring my youngest with me. I aim to do this three days a week, but I average about two in a good week! Pre-kids, I was at the gym 5 days a week so the drop in frequency has taken some getting used to. For me, a good workout keeps my anxiety low and is such an awesome mood booster. My youngest also needs social time so on non-gym days, I bring her to a playtime drop-in at the local community centre. working. I’ll switch between Robi and eco+amour work tasks. I’m usually interrupted a bunch of times by my daughter, and sometimes, I just have to put the work aside because my #1 job is Mom and I value that so much. It’s a juggling act for sure... lots of multi-tasking to get all the house/Mom/work duties done. Thank goodness for leftovers and quick salads! I try to always have fresh fruit and vegetables on hand so I can easily whip up nutritious meals since lunchtime always creeps up on me. putting my youngest down for a nap (if all goes well). This is when I get the most work done- I’ll try to schedule business calls at this time so I have zero distractions. I’ll usually set myself up with a peppermint tea, a soda water and get to work. doing bus pick up and catching up with my oldest. Work tasks start to wind down a bit at that point. I try to take inventory of what still needs to get done, so usually that means re-doing my To Do list (and hopefully checking off a bunch of things). The trouble with working from home (mostly on the kitchen table) is that I never physically leave my workplace, so it’s not a clean separation from work and home life. Over the years I’ve learned to better manage this, but there are still times when I’m prepping dinner and my laptop is open on the counter. What do you do after work? An event? Dinner? More work? #MomLife. I make dinner, bath time, read books, etc. I usually make two dinners- one for the littles and one for my partner and I (this is when we get to catch up on our days). I’ve always been into cooking and I love trying new recipes so I feel very ‘on the ball’ when I meal plan in advance. Then we (sans kids) sometimes watch a bit of Netflix (Schitt’s Creek at the moment, so funny!) or listen to some music. If I’m feeling run down, I love doing a face mask + bubble bath with chill music or a good book. I aim for 10:30 p.m. and on most nights do a yoga + meditation stretch right before (in my PJs!). I roll out a mat on my bedroom floor, kill the lights and light incense. It’s my one daily chance at complete peacefulness. It’s important for me to have that time to focus on all the positive things in my life. Throughout the day I’m either Mom, Entrepreneur or Wife and it can feel overwhelming at times- juggling everything. I am so, so grateful, though, and I use my meditation to reflect on that. I also love how ahhh-mazing it feels... especially when I’m sore from my weightlifting workouts. Best part about being your own boss? There are many, but if I had to choose one: loving everything about what I’ve created. I used to work in PR and found it difficult to sell or pitch products + brands I didn’t support or feel inspired by. I’m very passionate about Robi Luxury Skin Care and eco+amour, so I wake up inspired everyday about what’s to come. 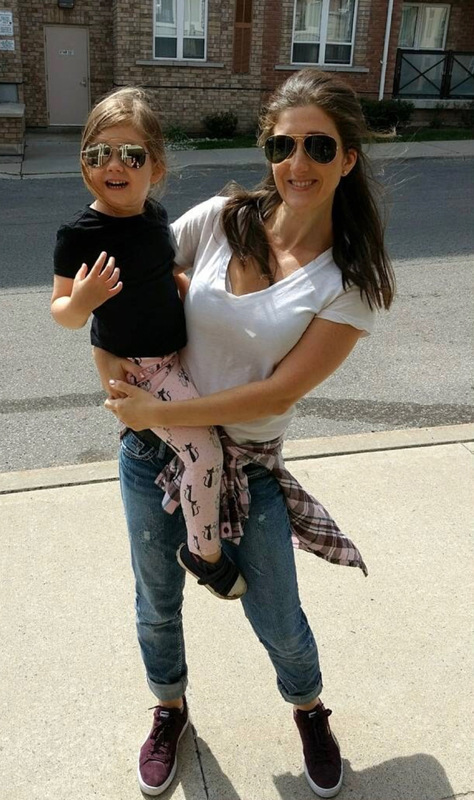 Number one tip on how to juggle being an entrepreneur and a mom? Making sure your kids are getting the attention they need is very important. To me, a successful business means nothing if I’m not connecting with my kids. I’m realizing this more and more, thankfully. I feel less overwhelmed and anxious with work stuff when I know my kids are happy. Finally, where can we find you on social media?